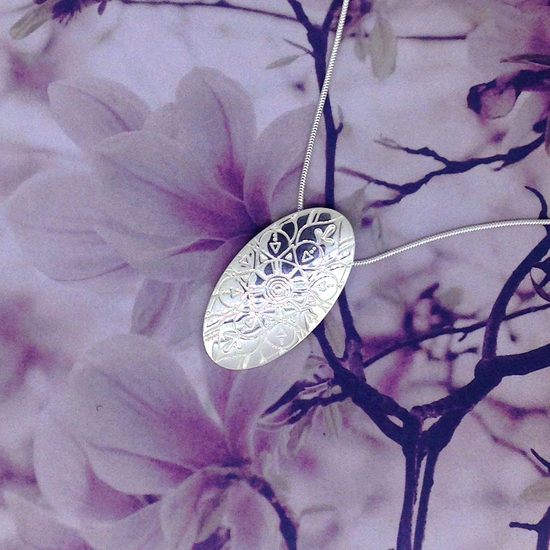 Jessica Flinn beautiful, silver jewellery. Designed in Sheffield especially for you. Jessica Flinn is one the of the most talked about names in jewellery design today, an award winner who, at just 27, is already become an established name in the jewellery industry. Born in Darlington, Jessica moved to Sheffield to study Metalwork and Jewellery at Sheffield Hallam University. Inspired by the city’s world famous industrial heritage, though, she stayed on and made Sheffield both her home and her inspiration, taking the techniques created for heavy industry and adapting them to create her distinctive and bold trademark style. She’s always happiest when she’s in Sheffield with husband Ollie, daughter Carmen and baby Robin in their converted Victorian chapel on the outskirts of the city. Every single piece from our collections has been designed and finished in Sheffield on site and using local businesses. Her collections have a modern, contemporary, luxury feel and are truly timeless, the heirlooms of the future. Unique and unusual her collections are the perfect gifts. Whether you want some statement designs or some delicate jewellery she has something for everyone. Our jewellery is perfect as both gifts or as an individual treat! Gorgeous Earrings, Bracelets and Necklaces in sterling silver. Many pieces can be personalised with a special message to give the recipient a contant reminder of how much you care perfect to mark a wedding day, birthday, birth of a baby or simply to tell your special lady that you love her. Thanks for your time today and thank you for visiting Jessica Flinn Designs. Personalised, bespoke items please add 3 days to delivery times. Jessica Flinn Designs is a VAT Registered Company. Jessica Flinn Designs is a VAT Registered Company. All prices include VAT at 20%.